Ladies and gentlemen of the Committee, I want to once again thank you all for coming. I have gathered you together to halt the rumors about different strains of Proxie creatures being spotted among the rank-and-file Swarms we’ve talked about before. Calm down, please. We all knew this was inevitable and it is something that Project: ELITE has created contingency plans for. The Janusians are highly adept at creating hybrids between different creatures in their spawning vats. We have identified several distinct varieties. The troops out on the field denote them as Bosses and combat programs have been created for dealing with them. But in the interest of keeping the Committee fully informed as to the threat we face, I have put together a small presentation about the kinds of Bosses we’ve encountered so far. Note that the names used for these creatures are what the troops commonly call them. Please excuse the informality of them. Lights and first slide, please. Starting out, we have the Searsting. It may well be the first attempt by Proxie scientists at merging their DNA with a Terran sample, in this case, a scorpion, obviously. Despite the many legs, the Searsting only moves at a jogging pace, but its stinger can puncture even the toughest body armor. Here is the Naga. Its serpentine origins are obvious, but its other characteristics mark it as yet another human/animal/Proxie hybrid. While its speed is no greater than normal, its digestive system allows it to spew a unique slime that facilitates locomotion to traverse terrain unhindered. Next slide, please. And I must warn you, the images continue to grow more disturbing, but please try and remain in the room. This is important. Janusians have been kidnapping humans for their experiments for quite some time. Heaven help those that fall into their hands, as they may end up like this. The Reanimate Harrier variants appear to retain some knowledge from their former human brains, able to form simple words and sentences, which has a horribly disconcerting effect. Its third leg provides exceptional stability and speed. As with most lesser aliens, troops should gun them down at range. This is the Gutslug. It received its designation from a field scientist that remarked that it resembled an intestinal parasite. Indeed, given the Proxie habit of utilizing Terrain samples for their horrific creations, it may well have been based on some Earthly creature caught alongside its human host. The Janusians seem to be adapting to some of our tactics and are compensating for them. For example, the Thraex appears to “see” via vibrations in the air and ground. Smoke grenades, flashbangs, and other sensory-assault weapons appear to have little effect. It moves with remarkable speed for a creature its size, and its claws have been recorded slicing through even tank armor with ease. Here we have the Dreadspit. Although it seems to have a head, its primary sensory organ is the tentacular protrusion emerging from its digestive tract. As one scientist put it, the beast is like “human and Proxie DNA put through a blender.” The results are a creature of minimal intelligence but armed with a potent caustic bile that it uses as a weapon on the field. This is the Mindeater. It appears to be two beings: the outer “shell” of muscle, chitin, and cybernetic weapons, and the inner “core”, believed to be yet another merging of human and Proxie DNA. The beast may have been intended as a liaison between Terrans and Proxies, but any diplomatic overtures are now impossible, as if we would ever want to parlay with the invaders... In battle it is famous for coordinating Proxies with deadly efficiency. Last of the variants for this presentation, we have the Ashar. While most Proxie soldiers are genetically designed for their specific role in the invasion, there is one strain of Janusian warrior that is vat-grown to be nothing less than a combat machine. The Ashar is armed with monomolecular-bladed gauntlets and plasma-particle pistols. Its entire existence is indiscriminate slaughter. Thankfully, we think the Ashar strain is difficult to successfully recreate for the Proxies, otherwise the ELITEs would suffer greatly on the front lines. As I said, I am here to dispel any rumors you might have heard. Yes, these aliens exist and we are fighting them out on the front lines as best we can. Only by learning more about them, studying their tactics, and discovering their weaknesses can we overcome them. Project: ELITE has the resources to deal with them, and I will keep you updated if any more alien variants are seen in the field. Project: ELITE is coming to Kickstarter on October 30 at 3 PM EST. Read the Project: ELITE Overview here. 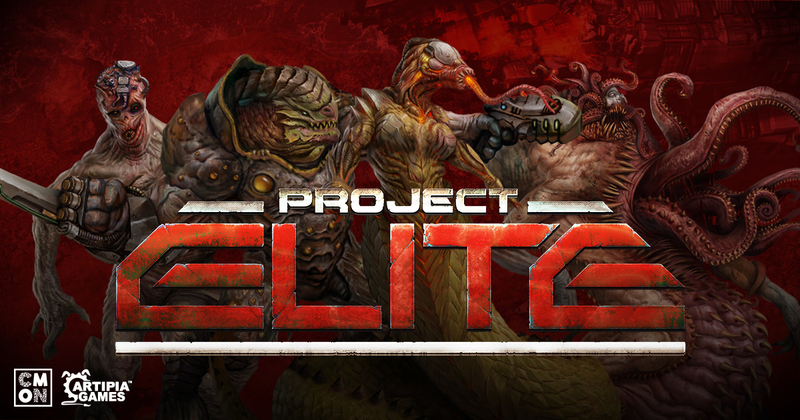 Read the Heroes of Project: ELITE article here. Read the Aliens of Project: ELITE article here. Read the Project: ELITE Designer article here.